A few years ago I stood in front of Jean-Michel Basquiat’s 1985 work ‘Glenn’ at MOMA in New York and stared at it the way lovers stare at each other in rom coms. I’d never been one of those gallery goers before (the ones that you stand behind like ‘come on mate, you’ve seen it now, move on’) but suddenly I was that guy. Shamelessly, I stepped forward to inspect the painting, then back, then closer again. I couldn’t take my eyes off the thing and, when I eventually parted ways, I was basically lovesick. The lovesickness was made extra tough by the fact there’s not a single Basquiat work on display in the UK. When the news came that a large scale exhibition of Basquiat’s work would be coming to Barbican I was legitimately over the moon - and ‘Boom For Real’ doesn’t disappoint. Given how vivid and multi dimensional every piece is, it seems counterintuitive to quantify this body of work with words: everything here is feelings. The deliciously lo fi opening rooms display Basquiat’s early graffiti work with Al Diaz: ‘SAMO’. Collectively we laugh at the cutting captions ‘SAMO AS AN END TO THE “9 to 5 “I WENT TO COLLEGE” “NOT 2NITE HONEY” BLUZ THINK’. When we remember that he was around 19 when he was making these observations and emblazoning them on the crumbling walls of New York, awe fills the room. The exhibition continues through Basquiat’s journey as an artist and provides cultural context to his works: if you stand in the middle of the exhibition, you find yourself at a precise intersection of Post Punk, Hip Hop and Jazz, all playing at once and providing a glimpse into the thousand energies which kept pushing Basquiat’s oil stick. Each work harbours a thousand different essences.The intimacy is inimitable. All of us take something different away from our private conversation with the artworks; it’s like being in a large scale treasure hunt searching for your own personal Basquiat, via references to cartoons, Hip Hop and enigmatic lists of animals. His ability to remix all the influences around him in order to create a mash up which has something for everyone without being in any way generic is deft beyond deft, boom for real, if you will. It’s not all bright colours and banging beats though; Basquiat’s self portraits border on harrowing. In contrast to the bright and eye catching hand with which he depicts his idols, his own self portraits are often flat, red eyed and death masque-esque. There’s a raw honesty to these visions of himself that reveal a young man who knew the highs of New York life as well as he knew its lows. Curators Dieter Buchart and Eleanor Nairne have done an exceptional job of conveying the various edges of Basquiat while gracefully declining the opportunity to focus on his personal rather than artistic life. 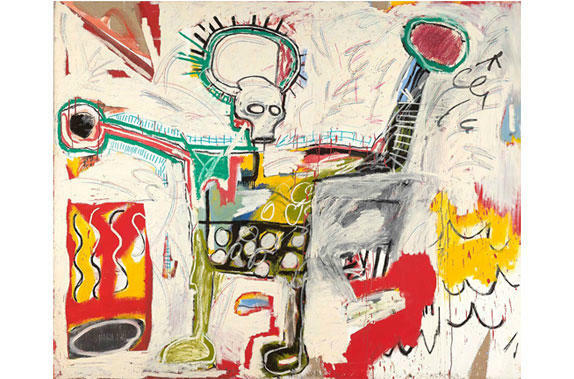 From paintings championing black icons who’d suffered racial prejudices, to his 1983 work ‘Hollywood Africans’ (which portrayed himself and fellow artist-musicians Rammellzee and Toxic amidst a collage of symbols representing the film industry's toxic racism) it’s clear that Basquiat willingly shouldered a consistent commitment to black representation and should be regarded as one of the most important artists in the world. In the programme for ‘Boom For Real’ Basquiat is described as ‘a young artist with no formal training, working against the racial prejudice of the time’. Given our current political climate and the fact every critic of the exhibition I’ve read mentions Basquiat’s heroin overdose in the first line of their review, it’s brazenly obvious that Basquiat is working against the racial prejudice of our times too. Basquiat achieved more in ten years than other artists achieve in a lifetime and his legacy can be seen everywhere. Usually I’d feel grief at the thought of such a talents untimely death but ‘Boom For Real’ is a loud and massive celebration of a life that was short, but certainly not wasted. ‘Boom For Real’ is an unmissable, inspiring dedication to a beautiful artist. 700 words later and I still can’t quite describe the feeling, so it follows, you have to go and see for yourself, feel for yourself, for real. The exhibition continues until 28th Jan. Get tickets here. Splash photo credit: Edo Bertoglio, Jean-Michel Basquiat wearing an American football helmet (1981). Don't forget to check your emails for the confirmation email. The Met is the tastiest clash of low-brow pop culture and high fashion, and we have some THOUGHTS. Who was Millicent Fawcett, who is Caroline Criado Perez, and why has it taken so long for a statue of a woman to make it to Parliament Square? We sat down with Donna McKevitt to talk new music, the importance of place, and what we can do to tackle sexism in the arts. There are moments of brilliance and moments of desperation in this experimental group exhibition. We had a chat with illustrator Venus Libido about relatability, community, and body image. Women artists are subverting the male gaze and taking back the power in this vibrant, vital exhibition. We caught up with the creator of multi-disciplinary showcase CRXSS PLATFXRM to talk curation and cross-pollination. Che's legacy: the spirit of revolution or t-shirts?